I grew up in a pretty red-necked town in the north. The term “blue blazer” was not used very often, but whenever we heard: “It’s a blue blazer folks” on the radio, it got us pretty excited. Now that I am a “southern” Okanagan girl these blue blazers are aplenty. 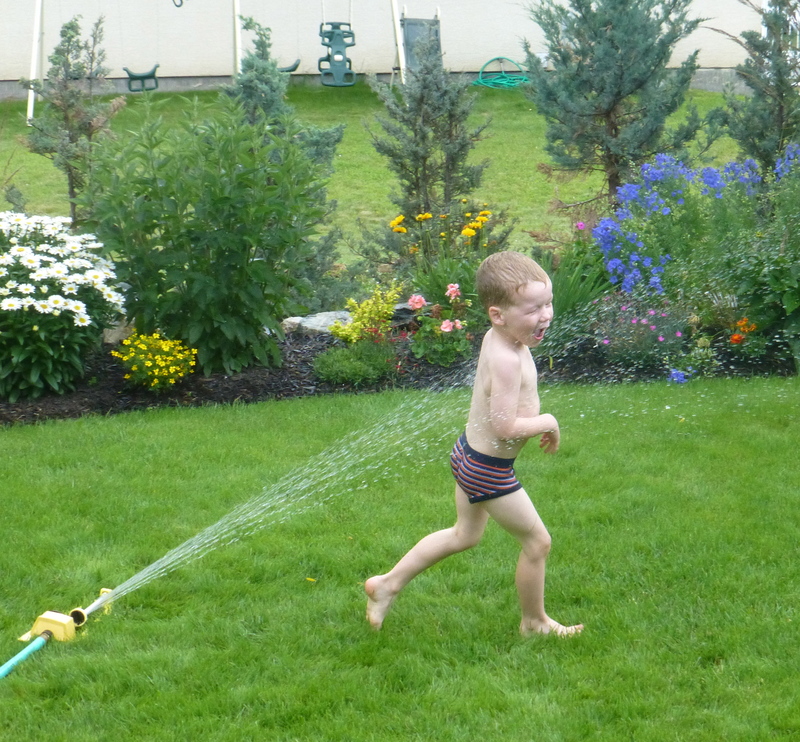 What did we do on this blue blazer Canada Day? 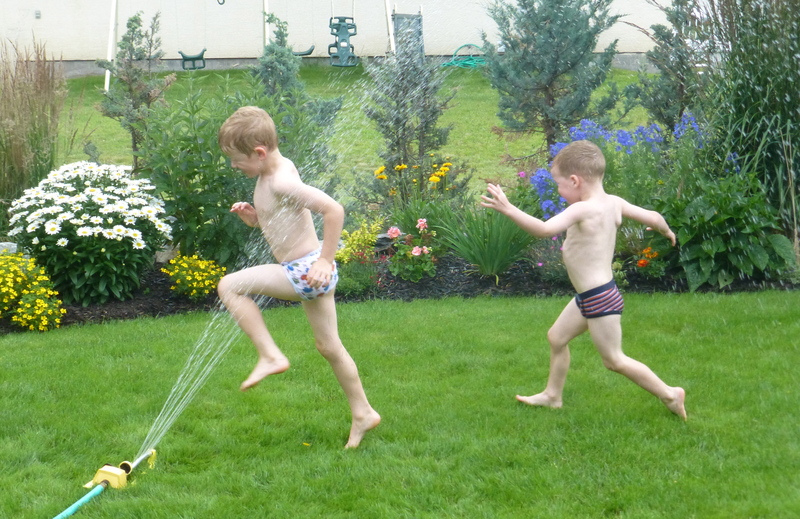 Yup, those are my big boys running through the sprinkler in their underwear! 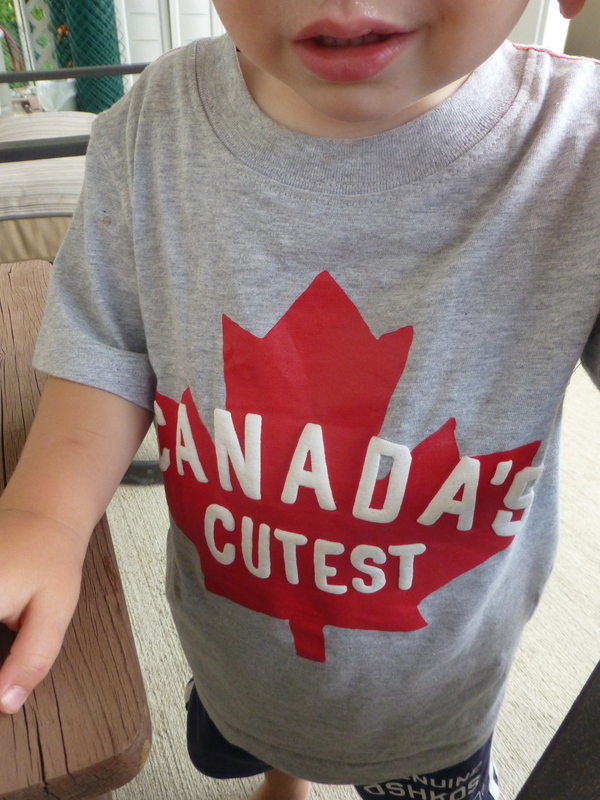 We bought an emergency t-shirt for little OC, as he pooped up the back while we were visiting the “new” house still under renovation. This hasn’t happened to us in a loooong time. Lastly, I gave my seven potted plants some loving care. I can’t wait to take my pots to the new house. You can see my mom’s beautiful garden/pergola/deer repellent in the background. 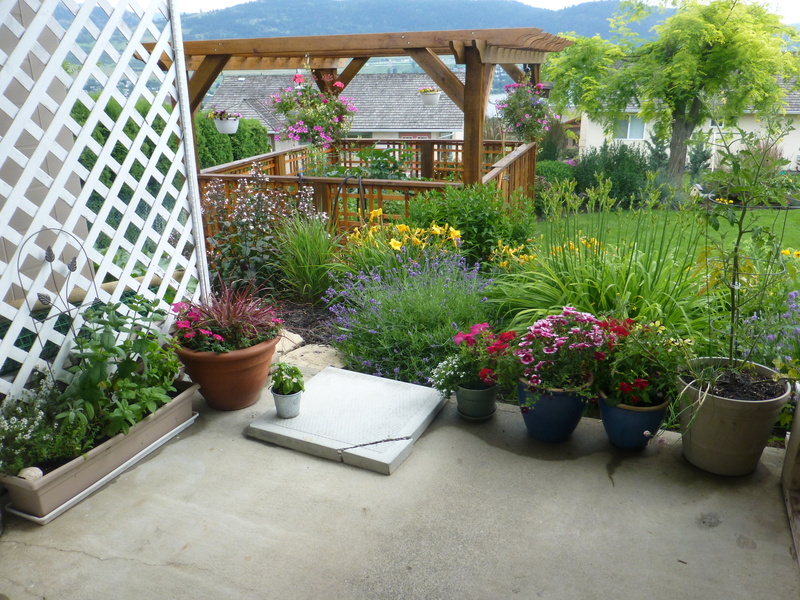 It is amazing what a little bit of colour will do for a yard, for my sense of peace and sense of home. Oh ya, I also wiped a lot of snot. Do we seem to be the only ones with a summer cold? Snot and coughing seem to be on the agenda for us these days. What is a blue blazer? A blue blazer is a very blue sky with no clouds. I grew up in Northern British Columbia where blue blazers were less than a dozen times per year between rain clouds and forest fire smoke. Thanks for the explanation. 🙂 Wow, it doesn’t sound like you had such nice weather over there in BC. Here we get blue skies a lot. But, it’s also HOT over here. I am now living in the southern part of BC which is actually a desert… so we get hot, hot, hot weather here and no black flies or huge mosquitoes to go with the southern climate. We still do get snow in the winter though, it is Canada after all. No black flies or mosquitoes? Sounds pretty good to me! If you want, you’re welcome to take some of ours. I guess “snow” is a relative thing. I remember having snow three feet tall and school not being canceled (in Canada, not here). Now they cancel snow for three centimeters. Today, I was wondering what area of Canada are you from? (I don’t want to ask for a specific place as I know how the Internet world is!!) I am interested to get a frame of reference for your move to Israel. Happy rest day from Canada. I am from Ontario. What do you mean by “frame of reference”? I think Canada is so diverse and it would be different for me if u moved from the Yukon or PEI to Israel rather than from the West or Ontario/Quebec. Just one of my many biases, I guess. Does this make sense? Yes, it makes sense. And I guess you’re right – it really WOULD be different. I never thought of it that way . . .